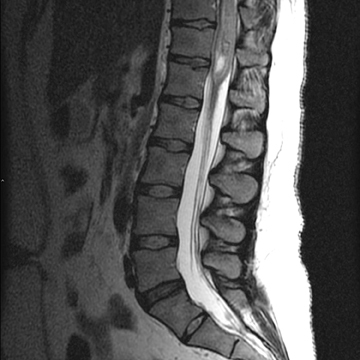 Sagittal T1-weighted and T2-weighted MR images of the lumbar spine demonstrate an enhancing intradural intramedullary mass extending from T10 to the conus medullaris (Figure 1). Sagittal T1 pre- and postcontrast (Figure 2) MR images reveal enhancement throughout the subarachnoid space of the lumbar and thoracic spine extending superiorly to the level of the cervical spine (not shown)and into the basilar cisterns (Figure 2). Ependymoma is the most common intramedullary spinal cord neoplasm of glial origin in adults, although its incidence remains relatively rare. 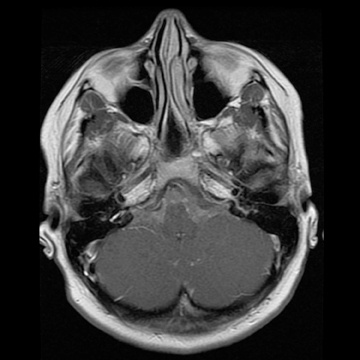 Ependymomas are treated with gross total resection, and MRI characteristics of associated cysts are important for surgical planning. The role of adjuvant therapy remains controversial. 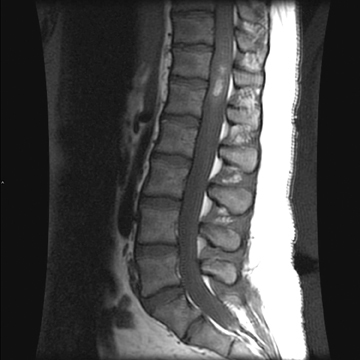 Shors SM, Jones TA, Jhaveri MD, Huckman MS. Myxopapillary ependymoma of the sacrum. Radiographics. 2006;26:S111-S116. Hanbali F, Fourney DR, Marmor E, et al. 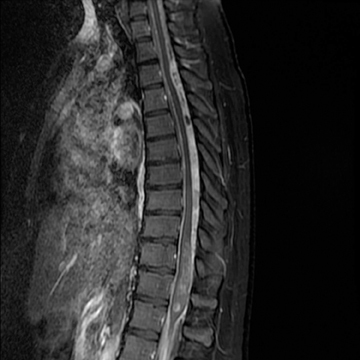 Spinal cord ependymoma: Radical surgical resection and outcome. Neurosurgery. 2002;51:1162-1174. Kahan H, Sklar EML, Post JD, Bruce JH. 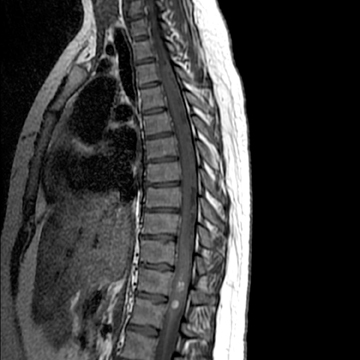 MR characteristics of histopathologic subtypes of spinal ependymoma. AJNR Am J Neuroadiol. 1996;17:143-150. Anaplastic spinal cord ependymoma. Appl Radiol.